Free Domain Quester Pro Download from FilesPack.com! Search for domains by unlimited number of keywords. Input unlimited number of words that relate to your business interests and these exact terms will be used as "root words" in an extensive search for available domain names. Choosing ".net without hyphen" or ".com with hyphen" options will often produce quality sounding names if you dont mind that syntax. A domain name is a company's unique identifier on the Internet. The same domain name can be used with a company's Web address and their email addresses. The format for a professional Web site is usually "www.company.com" while an e-mail address is generally name@company.com. 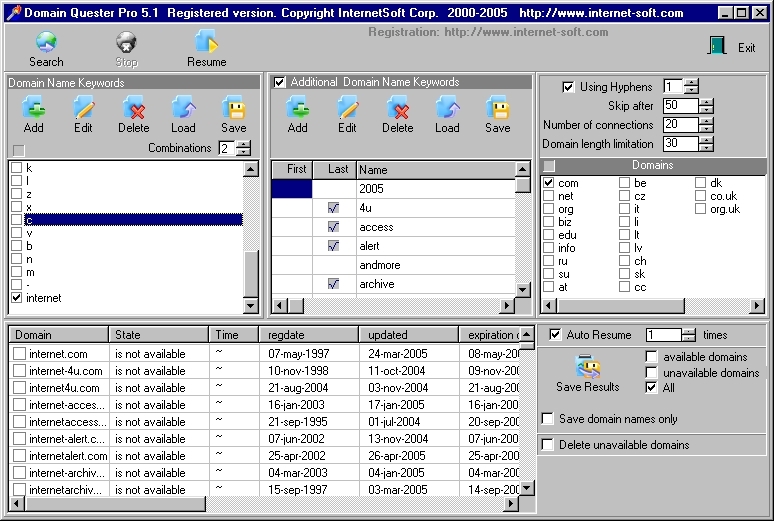 You can free download Domain Quester Pro 5.3 now.